Altar Cloths from The Realm of White Magic - Order On-line! Our Altar cloths are special, they are made with magickal intent and artistic patience, especially for you. Each item is individually hand crafted, there is no mass production in this web! It takes three days to create your altar cloth. Each altar cloth is hand stitched first, with magickal intent sewn in with each stitch. After machine sewing, the design of your choice is crafted onto the cloth. Lastly, the altar cloth is placed on a special altar for several days, before packing and sending to you. Includes information on use, and care instructions. Altar cloths are used for more than just to cover your altar. While they indeed have a specific purpose, you may choose to enjoy them as decoration. 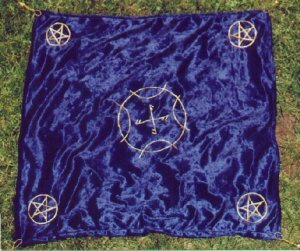 Many people use altar cloths as tapestries to hang above their altars, while others use them to drape their body or even wrap their Magickal Tools or Books of Shadows in. With care your Altar Cloth will last many generations, and may be passed on, adding personal symbols, if desired. Choose your Altar Cloth from our selection of magickal designs and colours. Each Altar Cloth is an individual creation - no two are exactly the same - allow approximately 2-3 weeks for delivery. Colors shown are meant for ease of browsing only, and are not meant to be representative of exact Altar Cloth colors. Sample colour swatches are available. With care your Altar Cloth will last many generations. © 2000 - 2014 by The Spyder Shoppe - Please seek permission first! © 2000 - 2014 The Realm Of White Magic - All Rights Reserved | Images © White Light Creations | Please seek permission first!